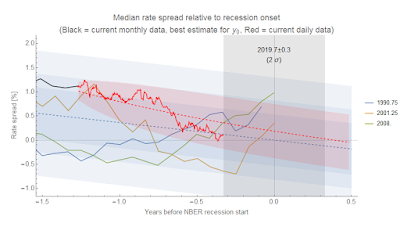 The gray band is where the interest rate spread indicator points to a recession based on a simple linear extrapolation (blue)/AR process (red) based on median (which in this case is basically equal to the principal component) of multiple spreads. Note that except for the 2001 recession, these median rate spreads started to head back up by this point over the past few recessions — reminding us that we will probably see the Fed lower rates (increasing the short-long rate spread) before a recession starts. 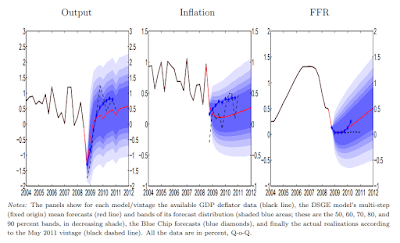 Or maybe the yield curve will prove to be a false alarm — to be placed on the scrapheap of indicators that lose their predictive ability as soon as they're widely recognized. What is Okun's law about, anyway?